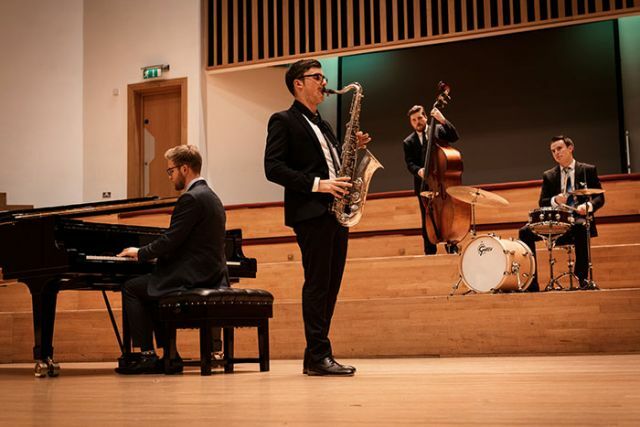 We all know how hectic planning your big day can be, so the team here at wedding-bands.co.uk have dedicated themselves to making it as easy and enjoyable as can be when it comes to booking one of our local jazz bands in Rutland. Nothing but the best will suffice when it comes to the ceremony of holy matrimony, and we’ve sought out the most talented, experienced and professional Rutland jazz bands the region has to offer. We are also happy to inform you that our rates are highly competitive – jazz bands in Rutland have never been so accessible! There are many kinds of jazz for you to explore here – trad jazz, contemporary jazz, Dixieland jazz, cool jazz, jazz standards by George Gershwin and Irving Berlin from the Great American Songbook, gypsy jazz in the style of Django Reinhardt, rat pack favourites as sung by Frank Sinatra, Dean Martin and Sammy Davis Jr, and even a few modern classics by Ed Sheeran, Daft Punk, Pharrell Williams and Rihanna reworked by our Rutland jazz bands into jazz numbers. Ashwell, Ayston, Barleythorpe, Barnsdale, Barrow, Barrowden, Belmesthorpe, Belton In Rutland, Bisbrooke, Braunston-in-Rutland, Brooke, Burley On The Hill, Caldecott, Clipsham, Cottesmore, Edith Weston, Egleton, Empingham, Essendine, Exton, Glaston, Great Casterton, Greetham, Gunthorpe, Hambleton, Ketton, Langham, Little Casterton, Lyddington, Lyndon, Manton, Market Overton, Martinsthorpe, Morcott, Normanton, North Luffenham, Oakam, Pickworth, Pilton, Preston, Ridlington, Ryhall, Seaton, South Luffenham, Stocken, Stoke Dry, Stretton, Teigh, Thistleton, Thorpe By Water, Tickencote, Tinwell, Tixover, Uppingham, Wardley, Whissendine, Whitwell and Wing are just a few of the towns and villages we can supply with one of our Rutland wedding bands. Once you’ve taken your pick, follow the YouTube and Soundcloud links to catch a preview of your Rutland jazz band. Then, all that stands between you and your goal is a small group of contact information boxes – fill this in, along with any other details about your wedding you think we should know, and we’ll aim to get back to you within 48 hours of you pressing ‘Send Inquiry’. Along with our local jazz bands we also represent a wide range of other options in the region including local Rutland string quartets, Rutland acoustic bands and Rutland harpists.